Welcome! Relax and enjoy your holidays in a pleasant environment. 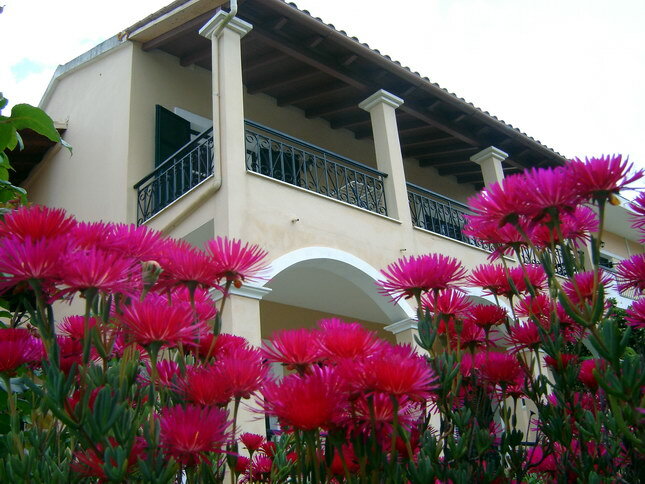 Nikos-Cassiopeia Apartments are located in the beautiful village of Kassiopi Corfu. Traditionally Greek in style and surrounded by gardens, provide a peaceful retreat, hence appealing to both families and couples. Within just 50 meters from the apartments, guests can find a supermarket. In addition, the pebbled beach of Avlaki is 1.5 km away, while Kalamionas beach is only 300 meters away. The airport of Corfu is at 35 km. We can arrange Airport transfer to and from the apartment for you. You can also find Car/Bike rental and other services upon your arrival to Kassiopi. So feel free to contact us and we will try to answer your question as soon as possible. Kassiopi Apartments – Be our guests! Spacious bedrooms and nice balconies provide the perfect opportunity for relaxation. A nice yard full of flowers surrounds the house. Nikos-Cassiopeia Apartments consist of a studio for up to 2 persons and 3 two-bedroom apartments for up to 4. All are equipped with Free-to-Air satellite TV, air conditioning, hair dryer and safety deposit box. Furthermore, they all include a kitchen with refrigerator and a dining area. We also provide Free WiFi throughout the property. Finally, in a quiet location just outside the resort, the apartments offer an authentic taste of island life. So reserve your room now through our online booking system and Live your Myth in Greece!